Buford, GA - AdEdge Technologies introduces environmentally friendly H2Zero Recycle/Backwash Systems for adsorption, oxidation and filtration water treatment systems. 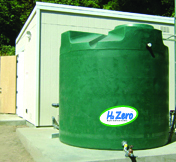 Developed by AdEdge Technologies Inc., H2Zero Recycle/Backwash systems conserve water by storing and treating contaminated backwash water from filtration and treatment systems. AdEdge H2Zero systems can be customized and designed for most manufacturers' adsorption, oxidation and filtration systems, whether backwashing is infrequent or performed one or more times per week. "Nearly all water filtration-related processes that remove target contaminants generate some liquid or solid residuals that need to be subsequently managed. Particularly with nuisance parameters such as iron and manganese," said Esmeralda Bonilla, Project Manager, AdEdge Technologies. "However, increasingly stringent regulatory discharge standards, costs, and emphasis on sustainability are demanding more environmentally friendly solutions for these residuals, as well as being the right thing to do." Key H2Zero features include a vertical polyethylene or a steel tank for holding the backwash water, a reclaim pump skid, integrated controls, particle filtration, as well as information data for solids management. Based in Atlanta, Ga., AdEdge Technologies Inc. is a worldwide leader in the design and manufacturing of integrated water treatment systems that feature specialty adsorbents for removal of arsenic, iron & manganese, uranium and other contaminants process or drinking water systems, environmental remediation, chemical, wastewater and mining applications.